Running kinda runs in my family. My older sister was the first one of us to start, and for as long as I can remember, there’s nothing she’s ever done halfheartedly. With a young family and a job at the Department of Justice, she finds time to train as an elite athlete and professionally coach so many running groups, I can’t even keep track (check out her online coaching advice and her groups, if you live in D.C!). My younger sister and I followed her example and have both logged hundreds of miles over the past 16 years. Now we’re working on the next generation. Today my older sister rooted for my 8-yr.-old nephew in a kids’ triathlon, Just Tryan It in D.C. At the same time, my girls ran their first official race–the Race Against Hate in Evanston. I couldn’t be prouder of all of them–not only for their efforts, but also for being a part of important causes. My nephew raised over $400 for kids fighting cancer. And my girls were part of a community program of thousands of people who stood up against hate and intolerance. It’s a race I try to join every year, not only because it’s local, fun and well-run, but also because I feel connected to the ideals. I remember the day Northwestern Coach Ricky Birdsong was killed and six of our community members were injured. I wasn’t yet a Chicago resident, but I was among the many students and community members at Indiana University who had been protesting the white supremacist on our campus and his message for months. The message of the Race Against Hate is one that I hope to impart upon my kids: everybody deserves to be treated with respect because of our shared humanity. That, and the message that running (and racing!) is lots of fun. 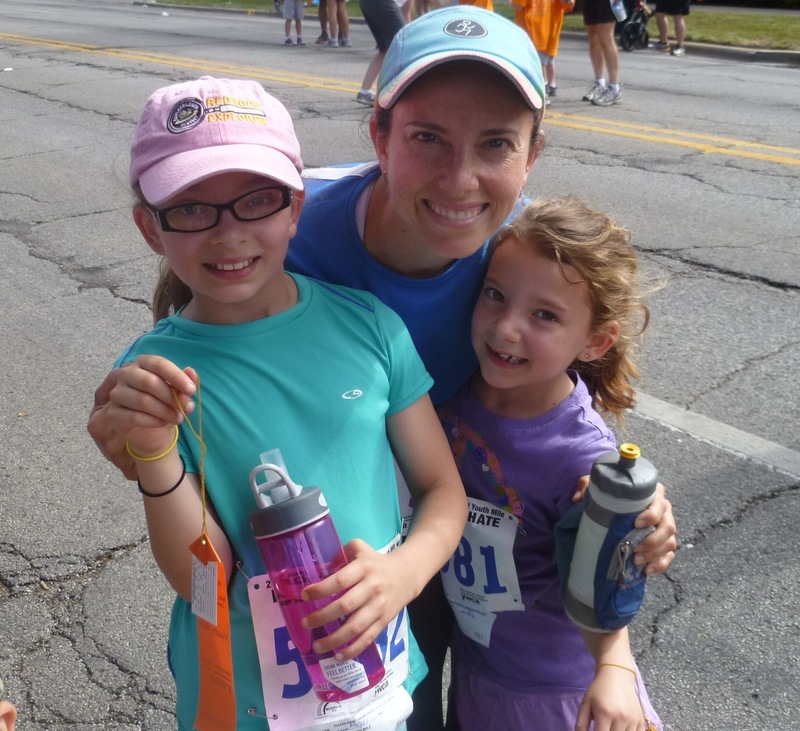 My kids received a bumper sticker in their race packets: “Running makes me ___.” One daughter filled in the blank with “happy” because she said, “Running really makes me happy. That’s why I smile the whole time.” I’m hoping that’ll keep her running for a lifetime.